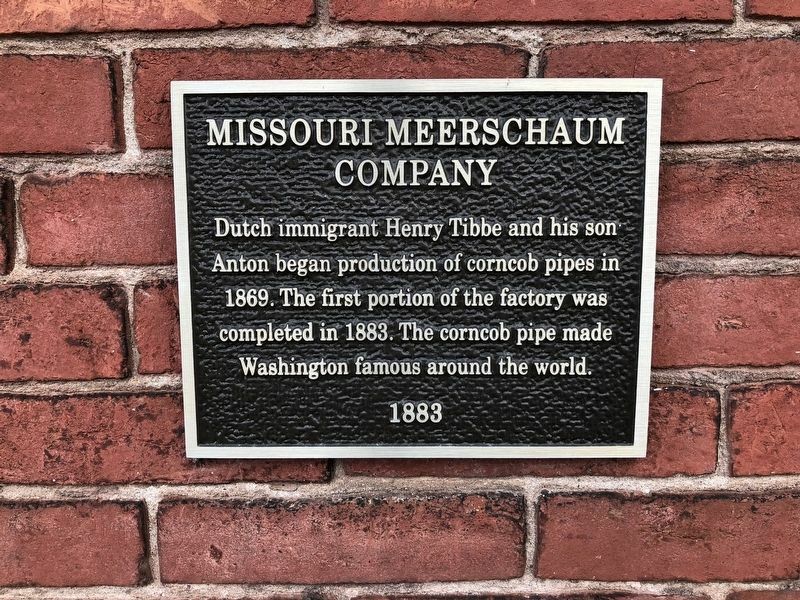 Dutch immigrant Henry Tibbe and his son Anton began production of corncob pipes in 1869. 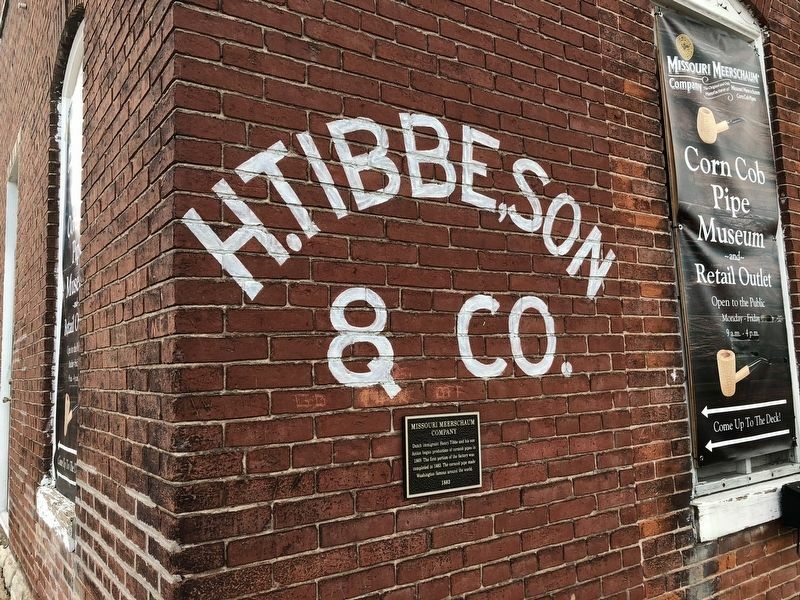 The first portion of the factory was completed in 1883. The corncob pipe made Washington famous around the world. Location. 38° 33.724′ N, 91° 0.812′ W. Marker is in Washington, Missouri, in Franklin County. Marker is at the intersection of West Front Street and Cedar Street, on the left when traveling west on West Front Street. Touch for map. Marker is at or near this postal address: 400 West Front Street, Washington MO 63090, United States of America. Touch for directions. Marker is immediately below painted company information. Henry A. Hartbauer (within shouting distance of this marker); Pacific House (about 300 feet away, measured in a direct line); Hibbeler Building (about 300 feet away). Touch for a list and map of all markers in Washington. More. 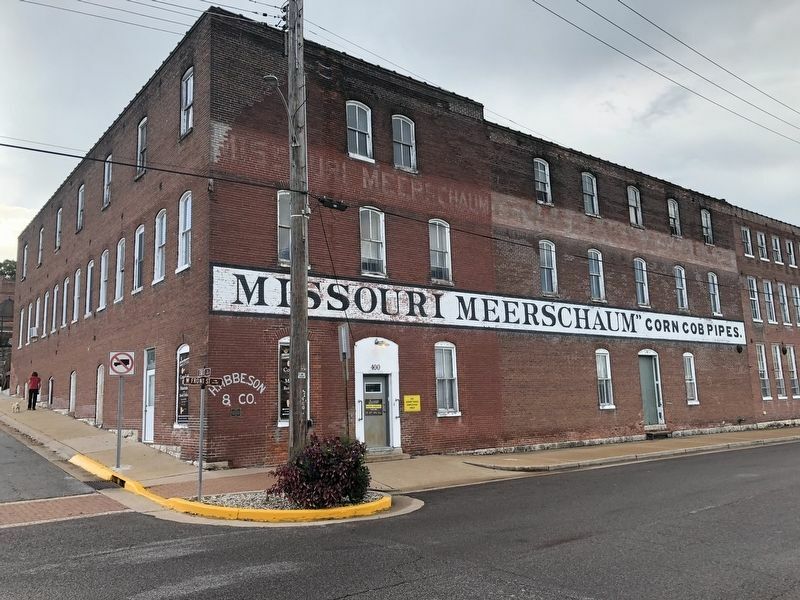 Search the internet for Missouri Meerschaum Company. Credits. This page was last revised on March 19, 2019. This page originally submitted on October 8, 2018, by Devry Becker Jones of Washington, District of Columbia. This page has been viewed 46 times since then and 12 times this year. Photos: 1, 2, 3. submitted on October 8, 2018, by Devry Becker Jones of Washington, District of Columbia. • Andrew Ruppenstein was the editor who published this page.